The Family Home Program is a flexible service that matches individuals with intellectual disabilities with people who can provide a caring, stable home environment. The supports offered are tailored to each situation and take into consideration the unique qualities and needs of everyone involved. For individuals who require the support of others to cope with ordinary challenges, Family Home arrangements are often preferred as an alternative to group living or other types of support arrangements. 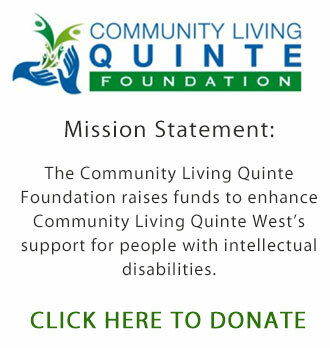 Community Living Quinte West believes that people enjoy an excellent quality of life when they share daily living and experience the close relationships in a family home. WHO ARE FAMILY HOME PROVIDERS? Providers are recruited through a variety of formal and informal methods. Advertising, word of mouth, and natural connections to a particular person with an intellectual disability help link these potential volunteers to the Family Home Program. Once potential providers are determined to be suitable candidates for the program, further involvement becomes dependent upon finding an appropriate match with an individual who wants this type of support. Family Home Providers are reimbursed for the expenses related to having another individual share their home. WHY DO INDIVIDUALS CHOOSE A FAMILY HOME? Some individuals use it as a stepping stone to a more independent (future) living situation. All potential Family Home Providers undergo an extensive screening process before an individual is placed in their care. This involves interviews with staff, natural families and the individual seeking a Family Home situation. In addition, background screening, reference checks and a health and safety inspection of their home is required. When Providers are considered a potential match for an individual, the process of exchanging information begins. Full disclosure is essential to the success of any match. Visits of increasing duration and frequency occur over the course of several months to allow ample time and opportunity to determine if the situation is right for everyone. Family Home staff review and assess each trial visit with all parties involved, in addition to ensuring that all questions/concerns are addressed. In consultation with the client and their family, they are responsible for determining whether the match should proceed and then guiding the process along at a pace that is comfortable for everyone. Once a Family Home Arrangement is in place, flexible supports are arranged to ensure the ongoing success and development of a lasting relationship. Family Home Program staff act as a liaison between all parties to ensure that everything runs as smoothly as possible. In full-time arrangements, a Community Support Worker is assigned to assist with planning appointments, finances and other areas of support specific to each particular situation. For more information call Lorrie Arsenault, Director of Programs and Community Involvement at 613-394-2222.